When I'm writing in Markdown, I'm not distracted by editing tools, formatting styles or even thinking about how my content will look. Markdown syntax lets me concentrate on thoughts, ideas that I want to convey, words – the important stuff. As you've seen in my previous posts, there are very few rules to learn. When I need to share a Markdown file with someone who doesn't know what Markdown is, I simply copy/paste the raw text into an email. I know the recipient will understand the layout because it's pretty intuitive. We actually are accustomed to some of the syntax simply from using email. People who write HTML all day have no problem adding tags to their content and might say that Markdown doesn't save them much time. I disagree though. If you have to share content with management or the C-Suite, it's better to have a document that isn't full of HTML tags. C-Suite folks may actually appreciate the plain text work that you produce since they can access it quickly, anywhere, from any device, without friction or loss of meaning. The technical folks will simply appreciate the extra thought in saving them work too. Just because we can write HTML all day doesn't mean we should expect others to pick through raw HTML code. On the other hand, why double our work by putting stuff into a Word document that is only going to end up on a webpage? Typing out work in a small mobile screen is also a lot easier when using Markdown as a starting point. Save yourself and everyone time and confussion with Markdown. Markdown will keep you from writing things multiple times for different use cases or stakeholders. In fact I often find myself writing and saving a post in Markdown, then deciding what platform I want to publish it on later. I know it will be shared with several stakeholders with varying levels of technical expertise. I don't really want to create multiple versions of my document or limit myself to a word document when I know that my content will eventually live on the web or is going look better in an HTML context. I want to convey my ideas so that the technical folks can visualize the layout on the web in proper HTML 5. By using Markdown, I can copy/paste my Markdown file content into an email and send it to all the relevant stakeholders. When it reaches a web person who needs to convert it into HTML for a place online, the structure is ready. You see, Markdown is designed to easily convert to HTML 5 as I've mentioned. There are many tools and text editors that will handle the conversion with just the click of a menu button. The structure of Markdown produces fully compliant HTML 5 and will also help you on the SEO side. Yet, the less technical folks will still understand the original file without any problems. There's no need to worry about how the content will actually look or appear when it hits the web, because another web language called CSS will take over. A web designer writes rules or styles that govern the look. Headers will be a certain size, color and font based upon a CSS stylesheet that the designer controls. The same applies to paragraphs, words that are emphasized, blockquotes, lists and even photos. The front-end folks have the appearance taken care of so that it will match the branding requirements of a website. So you can see that Markdown is all about writing, not formatting. We can place our words and ideas into a certain framework with titles, sub-titles, lists, ect, but we don't worry about how it will actually look on the web. Inserting photos, the Markdown way, also means that you can stop sending huge attachments via email and simply store your images (assets) on a web server instead. It makes more sense for content that is going to end up on the web anyways and it's much easier to manage versions of photos on a web server than always updating photos in a document. For example, if you load a photo to your own web or company server, then replace it on the server with a newer updated photo of the same name, you don't even have to touch your Markdown file because the URL will be unchanged. Trust me. This all saves time. I can repurpose my Markdown content and post it anywhere because it is simply plain text. There are some places on the web that actually support Markdown too and will convert it to HTML 5 automatically. Ello is a social network site that allows Markdown for example when writing posts. There are a lot of people in Silicon Valley who love Medium, a writing/blogging platform, because it reduces formatting to a few simple items using a pop-up editing box. It's called a WYSIWYG (What You See Is What You Get) approach because you can actually see the live formatting changes as you type. It just removes the extra formatting options that a word processor would have. Well, Markdown is easier than that. I post on Medium using Markdown syntax as an act of defiance because I think any modern blogging platform should really support Markdown. Medium will not automatically convert my Markdown syntax into HTML 5, but anyone reading my posts will still understand them. Ello, on the other hand, will convert it. Since learning Markdown, I also never use a note taking app. By storing Markdown files in the cloud, say on Dropbox, you have access to your notes from any device. You can access your content from any text editor that handles plain text – that means all of them. One simply writes notes using Markdown within a text editor and saves the file in Dropbox to access it from the cloud on any device later – or to send a link of the file to someone else. Markdown is also a bloggers dream. If you write for WordPress or any other CMS, starting in Markdown will especially help you to repurpose content across platforms and social media channels. Many platforms also offer plug-ins that support Markdown conversion to HTML 5. I have Markdown files saved in Dropbox with names that include my frequent writing spots like WordPress, Ello and Medium. Doing this allows me to simply reuse already created files for writing new posts. It gives me a sort of running project list of places to write content for, a version control process (Dropbox keeps track of previously edited file versions), and an easy way to write simultaneous works-in-progress across multiple platforms. I even have a comments file simply for writing comments/replies for online posts that I will then post somewhere on the web after I'm satisfied with my edits. Markdown gives me a consistent writing experience that I can use anywhere without having to adjust to another platform's own editor or posting methodology. That's less friction and overhead for me. I won't even get into how Markdown can be used with a service called IFTTT to automated cross posting or syndication of content. It's pretty awesome and nerdy what can be done though. * Have the recipient rename the attachment by just adding .txt to the end of the file. sample.md would become sample.txt Or you could rename it yourself before sending it as an attachment. * Simply copy/paste the contents of your Markdown file directly into the body of your email. You could even export the Markdown file into HTML 5 if you have a text editor that does this automatically and paste the results into your email body. Your email client will render the HTML body in a nicely formatted way. I've been using Markdown for awhile and I'm still amazed at the amount of time and headaches it saves me. I haven't used Word in ages other than to open attachments from others. There is breath of fresh air and freedom when you give up on all the formatting options that a word processing app brings. 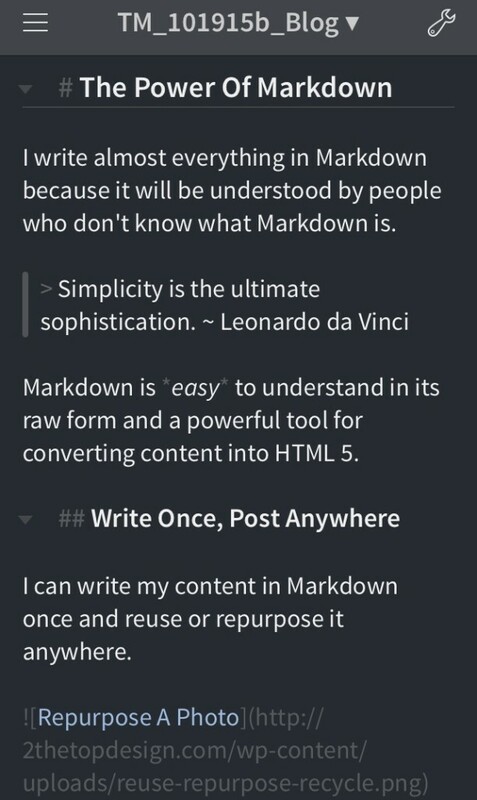 Although, I'm comfortable with any word processing app, I want to use Markdown because of how light it feels. Writing becomes fun again with fewer distractions. There's just a lot less overhead when you write in plain text using Markdown. So let's take a look at the Markdown I wrote above and see how it looks after I converted it to HTML 5 with a simple tap of a button. You can see that plain text turns out rather nicely with Markdown. I write almost everything in Markdown because it will be understood by people who don't know what Markdown is. Markdown is easy to understand in its raw form and a powerful tool for converting content into HTML 5. I can write my content in Markdown once and reuse or repurpose it anywhere. Thank you for joining me on this Markdown journey. There are many Markdown cheat sheets you can find on the web to help you remember the syntax. It doesn't take long to get it down though. If you're on a Mac or iOS device, I will recommend Byword as a great text editor that gets out of your way while writing. If you're a power user type, try Editorial for iOS. Linking it to a Dropbox account will enable you to access and edit your files from the desktop or mobile screen. Contact me if you have any questions. I think you'll have fun while you Write Once, Post Anywhere with Markdown. It really is one of those things that give an ah-ha moment as you use it and see the benefits first-hand. hey i didnt see the date of this post but isnt it true that now medium uses markdown? do you have any thoughts on their implementation? Actually, I wasn’t aware that Medium added Markdown support within their post editor. Is that something new? I know that it’s possible to import a Markdown post through a 3rd part app, like Byword for example, but haven’t seen anything that they were supporting it natively.